Well another busy day, so Molly and I were up early and out into another grey misty day, no rain thankfully. Then Molly is off to stay with my neighbour Barry and his greyhound Shifty, as I am off to my art group. We meet up once a month to discuss the art we have been working on, show some off and learn a new skill or technique. Julie showed us gesso onto calico, then we drew painted and doodled on this. Next time we will be making this into the cover of a mini book. Much excitement as we have a new member big welcome to Eve, she's going to be a great new member as she's done lots of crafts and led workshops. This month she bought in Japanese stitched balls. Yes sounds weird but they were very lovely. I forgot to take a picture. Julie had finished her Valentines postcards and Linda had done some lovely machine embriodery. I am so pleased as I only gave Linda a very quick demo the other week and she's really got the hang of free embroidery on her machine. We all learn so much from each other and we don't charge either. Now for some really exciting news, Cherry has got her own exhibition at a new gallery in Leigh on Sea. We are all going to the Open Day to meet the artist. How exciting is that for Cherry, she has worked so hard to promote her art. Well done Cherry!!! Front view of the mannequin, this one has a mini skirt, neck ruff and shoulder epaulettes. More to go yet but its coming together well. I've just walked up to the farm barn to get two more mannequins. One same size as this one, but with longer pole. Other is quite a bit larger. Then I have two more left, one female and one male. I only met one car on my return journey, its someone I know so no funny looks at the woman pushing mannequins in a garden centre trolley. They are used to me round here. I am working the picture from yesterday again, was not happy with that but too tired to finish it today. Now I am bushed and am going to cook tea, Chinese Twice Cooked Pork with rice noodles and stir fry, homemade of course. Early bed for me. 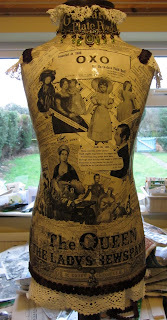 New mannequin looks amazing, be sure to keep us updated with it's progress... I love it..